Built to house a Christian mission to the Stockbridge Indians, this museum house holds furnishings dating from 1740 or earlier. 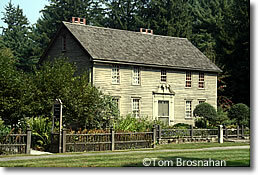 Mission House, on Main Street in the center of Stockbridge MA (map), was built in 1739 by the Reverend John Sergeant to carry out his Christian mission to the Stockbridge Indians. The house is a National Historic Landmark owned by The Trustees of Reservations, and is furnished in American pieces all dating from 1740 or earlier. Guided tours are offered. It's open from Memorial Day (late May) to Columbus Day (mid-October), 11 am to 4 pm, closed Monday.